The below flash fiction is set in the Selkies’ Skins universe sometime after Kirsty and David have graduated, married, and started their life together. I have left it intentionally unclear as to exactly how long after graduation. It is long enough for a house in the once again village of Seal Point to be finished near the home Kirsty grew up in. David rummaged in the impeccably clean pantry looking for his tinned fish. Kirsty was at the office doing whatever her father had called her in for. Her skin was another matter. She had left it to keep him company since she expected a boring day of paperwork and meetings. Said skin was very enthusiastic about staying home, causing mischief, and preventing him from being too sucked into his own pursuits. Kirstyskin never liked hanging on a peg pretending to be a cloak, at least not since she’d gained enough strength to move around on her own. He may, or may not, have contributed to this. It was so hard not to spoil such a cute skin, especially when it so exuberantly communicated things Kirsty herself tried to be more adult and circumspect about. He still couldn’t understand why anyone in their right mind would hide a skin from the corresponding selkie, wife or not. Marsali’s husband had deprived himself and her of a great deal, in his opinion. “Ork! Ork!” The skin attempted to whisper. The barking did not translate well into a whisper at all. She hauled up on her tail and clapped her flippers at him excitedly. Her front gaped open to reveal her smooth suede inside. Sparkling blue eyes glinted at him. “Feesh! Feeeesh! Feeeeeeeesh?” The skin flopped down and rolled over and over around the kitchen behind him. How and what she filled herself with whenever she’d do this he had no clue. Kirstyskin did not exactly hold still long enough for him to ever satisfy his curiosity about that. “Feeeeeesh…” The rambunctious skin calmed herself and plopped a head on his foot, nibbling at his ankle through his socks. “I’m not a fish, silly selkie skin.” His rummaging finally yielded fruit. “Are. Wolffish.” She rumbled at him. “Bad pun.” He grinned as he looked down at the very self satisfied smirk on the skin’s face. Kirstyskin blew an impish raspberry at him. One can of little anchovies was still hidden. Unfortunately now she knew the hiding spot. It was just a matter of time before she’d sneak up there in the middle of the night with a chair. He’d have to consult Imp later for ideas on where he could hide Emergency Fish so he’d be more likely to have spares. David’s musing as he made his way to the corner he preferred to flop with her in was interrupted by a flying streak of white. Said streak humped along the floor at top speed from the kitchen to the living room barking gleefully around her mouthful. Laughter floated back to him and thumping started up the steps. His own laughter joined hers as he started running after her. This story will be available to listen to next week on my Patreon, Youtube, and Soundcloud. Today's recorded flash fiction is the one posted last week. I read for you my retelling of the tale of Wikatcha. Are you interested in having your work featured? Thinking about having your story read in the Youtube programs? Send a note. Guests are welcome. This was a well done creepy story. Parts of it did not hit me as hard as they should have. That may have to do with reading in bed with the heater going and surrounded by dogs though, so I was not given the solitude to fully appreciate all that had been intended to be scary. There were still several things that broke through though. Vivienne was one of those things that managed to get through the protection of doggie sentries. So did the explanation tale of how Carl came to become one of the ghosts. Some are going to be confused and off-put by the way the story is arranged. There are times that flashbacks take place where we experience with the characters an important past event that would have made no sense if it were discovered in chronological order. They are clearly delineated though and the author does a good job of moving us back and forth as non jarringly as possible. I will certainly be reading more of this series. Storenvy: http://thgstardragon.storenvy.com/ Check now and then for new things, some I can't list just yet. Want to send me something to read on here or to review? Have a particular request? Need to send something the old-fashioned way? Maybe you've got a hard copy of a book you want reviewed, or a copy of some of your own work for me to look over? Perhaps you have some of your work you'd like me to record? Email necessary? Send me a note at ladyrainstardragon@hotmail.com but bear in mind that I have been having problems with it eating things sometimes from even verified senders. Gather under the tree with the traveling bard while she recounts poetry and short stories centering around various mythical and magical creatures. Month by month her project grew as her supporters lent their ears. Here and there she shares some artwork, some snippets about her books, and even a little in the realms of meditation. This is the third year of her Patreon anthology, and this is arranged in month by month format. This anthology is a handy gathering of the year's work, not including the progress made in the "Selkies' Skins: Temple and Skinquest" manuscript which will be provided her patrons separately. Although some images are in black and white others are in color. Even though they look good in black and white it does not do them justice. For the full effect of the art pieces it is suggested that you view on a color capable device. Year four's collection ends in August 2019 which will also mark the beginning of year five. Gather under the tree with the traveling bard while she recounts poetry and short stories centering around various mythical and magical creatures. Month by month her project grew as her supporters lent their ears. Here and there she shares some artwork, some snippets about her books, and even a little in the realms of meditation. This is the second year of her Patreon anthology, and this is arranged in month by month format. This anthology is a handy gathering of the year's work, not including the progress made in the "Selkies' Skins: Temple and Skinquest" manuscript which will be provided her patrons separately. This title contains color art among the leaves and is best viewed on a color capable device. Black and white does not give the full impact. Here is the Sunday story. This week for the library is "Buddhistic Prayer" wherein a husband tries to cope with his wife's overzealous devotion to Pure Land practices. 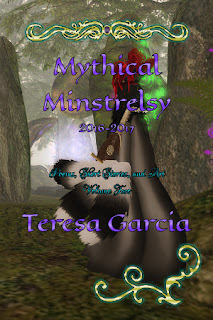 Mythical Minstrelsy Volume Three by Teresa Garcia is now available on Smashwords. This collection of fantasy #Art #Poetry and #ShortStories spans the year of August 2017 to August 2018. http://ow.ly/rlsQ30ousjY Volumes Two and Three are to port to Amazon as well after conversion. 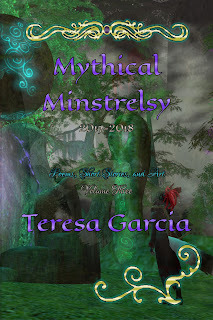 For the curious the cover art incorporates Second Life Photography done in the Nisa parcel (part of the Dreaming Twilight group) in the sim of Ontario by myself (Teresa Garcia) via Amehana Ishtari/Arashi. The figure is "Maria Lightwatch" as represented on my main account. The singing stones have since been relocated to one of the other parcels controlled by the group. Each of the Dreaming Twilight parcels represents another country and/or world in the Dreaming Twilight universe/multiverse/world. Visitors are welcome and encouraged. One can expect to find either Maria or her lute featuring in cover art for this series of anthologies. It is Flash Fiction Friday! Today's flash fiction more closely fits as a typical short story. Today's flash fiction reading "Water Bride, or How Kolowisi gained his bride"
This was originally posted in writing on Teresa Garcia's Patreon and can also be found in her DeviantArt gallery. This and other tales and poems like it will be gathered into the fourth volume of the Mythical Minstrelsy anthology series. The end of volume four and beginning of volume five is in August. For this Friday's written piece I have "Wikatcha," a fanciful retelling of legend surrounded a water dwelling cat from Creek mythology. It is told rather much differently than how they tell the legend as it is my own version.